Hereford: Yates, Thomas, Greenslade, O'Sullivan (Wharton 62), Cullinane-Liburd, Gowling, Lloyd, Owen-Evans, Finn (Smith 84), Roberts (Richards 69), Symons. Subs not used: Dielna, Horsell. Chester: Shenton, Moran, Howson, Thomson (Waters 16), Grand, Green, Roberts, Mooney (Deane Smalley 59), Mahon (Marsh-Hughes 79), Jackson, Dudley. Subs not used: Dawson, Noble. Chester rounded off 2018 with their injury-hit side making a disappointing visit to Hereford and a result that dropped them to fifth in the league table. It had been a much-anticipated day out, with a feeling that the Blues must be due a win on their travels and many of the travelling 354 fans making the most of the excellent local hostelries that Hereford has to offer. Long-standing fans would have noticed a few changes in the city centre since the two teams last met in the city five years ago, with a smart new shopping centre in place of the former cattle market site. But the excellent Wye Valley Barrels pub across the city centre hasn’t changed and the pre-match beer was as good as ever! Both clubs have gone in different directions since that 2013-14 season, when Chester kept their spot in the Conference with the former Hereford United’s sad demise, so it was good to renew old acquaintances. But sadly for Chester, the trip down memory lane didn’t end up with a repetition of the hard-earned point they achieved in 2013. Even taking account of the weakened nature of the team, it was not a good performance. While it was great to see George Green making his first start since signing for the club, it was desperately disappointing to see Matty Thomson go off after just 10 minutes when he just seemed to fall awkwardly and went off in agony with a problem with his left leg. Fellow academy graduate Matty Waters replaced him, but Thomson was a significant loss to the game. It was no surprise that the Bulls went ahead at around 30 minutes when a good pass to Danny Greenslade saw him strike the ball well past Chester goalkeeper Grant Shenton. At the other end, Hereford’s goalkeeper Matt Yates saved well from Craig Mahon – probably Chester’s best chance of the game. The second half wasn’t much of an improvement, and all-round it was not a showpiece game of football. To cap it all off, Mike Symons – the player announced as Hereford’s man-of-the-match – had been taunted for his size by the Chester fans and had the turning circle of a Hereford bull. But, despite his lumbering nature, he found himself in the right place to get the ball across the line from close range after his team won a corner in the 70th minute. Chester did step up the pressure in the final spell of the match, but it was too little, too late. Sadly they never looked liked repeating the 2-2 scoreline from the club’s last visit to Edgar Street, and they ended 2018 on a lacklustre note. Booked: Grand, Mahon, Green, Roberts. Southport: Hanford, Winnard, Ogle, Edwards, Astles, Morgan, Charles, Wood, Gilchrist (Green 72), Archer (Sampson 78), Bauress (Parry 72). Subs not used: Homson-Smith, Mohammed. Chester: Shenton, Thomson (Deane Smalley 72), Grand, Howson, Moran, Roberts, Mooney, Noble (Green 56), Dudley, Dawson (Jackson 46), Mahon. Subs not used: Waters, Marsh-Hughes. Chester were forced into changes before the match with injuries to Akwasi Asante and Gary Stopforth ruling the duo out to be replaced by Gary Roberts and Dan Mooney. It was former Blue Ryan Astles who had the opening chance of the game heading wide from a corner, before Jason Gilchrist headed over a golden opportunity from six yards out as the Chester defence looked rattled. Five minutes before the break the Sandgrounders took a deserved lead as Dion Charles broke down the right before crossing for David Morgan who shot past the advancing Grant Shenton. On the stroke of half time Southport added a second as Reagan Ogle’s long throw caused havoc in the Blues defence and Bauress was on hand to score from the edge of the box. Shenton produced a fine save to deny Charles as the home side started the second half well. Chester though began to create a few chances themselves with Anthony Dudley looping in a header that was saved by Dan Hanford in the home goal and Cain Noble saw an effort flash just wide as a thick fog started to roll in across the pitch. George Green made his much anticipated debut coming on for Noble before Bradley Jackson saw a great effort cleared off the line by Dean Winnard. 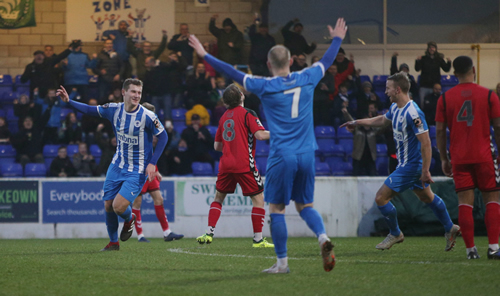 The points were wrapped up in the final minute as Morgan shot past Shenton from the edge of the box to complete a miserable Boxing Day for Chester. Chester: Shenton, Moran, Howson, Thomson, Noble, Grand, Stopforth, Asante (Mooney 57), Dudley, Dawson (Jackson 72), Mahon (Deane Smalley 90). Subs not used: Green, Waters. AFC Telford United: Wycherley, White, Morley, Deeney, Sutton, Streete, Cowans (Barnett 62), McQuilkin (Brown 88), Morgan-Smith (Knights 77), Udoh, Daniels. Subs not used: Royle, Ceesay. Chester came from behind to claim three hard earned points with goals from Akwasi Asante and Anthony Dudley. In a pulsating first half the Blues had the ball in the net on ten minutes with Asante heading in an Adam Dawson free kick only for the effort to be ruled out for offside. Dudley headed wide and Asante saw an effort saved by Andrew Wycherley before Telford took the lead against the run of play. A free kick from Steph Morley was met by the head of Amari Morgan-Smith who scored past Grant Shenton. Chester responded and drew level almost immediately with man-of-the-moment Asante latching on to a Dudley through ball to steer a shot past Wycherley. Six minutes after the break Chester took the lead with Anthony Dudley seeing a first effort blocked before scoring the rebound. Telford through they’d equalised soon after with the ball being bundled into the net only for the effort to be ruled out for a push on Shenton. Asante limped off to be replaced by Dan Mooney before the Bucks were reduced to ten men with Shane Sutton seeing red after a last-man foul on Dudley. Bradley Jackson came on for as assured debut before the final effort of the game fell to Telford’s Brendan Daniels whose near post corner was scrambled away as Chester held out for three more vital home points. Stockport County: Hinchcliffe, Minihan, Duxbury, Keane, Palmer, Stott, Thomas (Cowan 85), Walker, Mulhern (Bell 68), Osborne (Stephenson 46), Warburton. Subs not used: Ormson, Turnbull. Chester: Shenton, Grand, Howson, Thomson, Livesey (Deane Smalley 22), Stopforth, Roberts, Dawson, Mahon, Dudley, Asante (Noble 88). Subs not used: Murray, Brown, Marsh-Hughes. Chester created several great chances but had to settle for a point from Stockport County. It was an open start to the match that saw Matty Warburton drag a shot wide for County in the opening minutes. At the other end Chester almost took the lead on eight minutes, great work from Anthony Dawson set up Akwasi Asante whose cross shot hit the far post and bounced out. The Blues were forced into a change midway through the half with Dan Livesey limping off to be replaced by Deane Smalley. Warburton hit the post for Stockport moments after the change before the Blues made the breakthrough on 32 minutes. A great turn and shot from Asante forced a fine save from Ben Hinchcliffe in the home goal. Craig Mahon swung over the resulting corner and Asante was on hand at the back post to tap home the opening goal. A minute before the break the home side drew level. Scott Duxbury swung in a free kick that had Smalley on the arm with referee Adam Herczeg pointing to the spot. Sam Walker gave Grant Shenton no chance with the resulting penalty kick. The second half proved a scrappy affair, Anthony Dudley forced a fingertip save from Hinchcliffe on 65 minutes before Asante saw a great header from a Simon Grand cross gathered by the overworked ‘keeper. Duxbury header over and Warburton saw a shot blocked in a hectic closing ten minutes that also saw the Blues appeals for a penalty waived away after a clumsy challenge on Asante in the area. Darlington: Maddison, Trotman, Galbraith (O’Hanlon 56), Elliott, Burn, Hughes, Henshall (Lingthep 90), Wheatley, Saunders, Nicholson, Thompson Subs not used: Hall, Glover, Stansfield. A perfect hat-trick on his debut for loan striker Akwasi Asante brings Chester three much needed points that takes the Blues up to third place. Chester started strong with defender Steve Howson heading over a Dan Mooney free kick as early as the fifth minute. Quakers ‘keeper Jonathan Maddison had to make a smart save to deny Anthony Dudley who had raced through onto a one-on-one before shooting from a narrow angle. It was all Chester, Mooney saw a long range effort curl just wide and Maddison produced another fine save to deny Craig Mahon as Chester looked to turn their dominance into goals. That goal came on 27 minutes as Asante marked his debut with a fine header from a left wing Mahon cross that gave Maddison no chance. Chester soon found themselves down to ten men as Mooney, who had already found himself in the referee’s notebook was shown a second yellow card for a foul on Jordan Nicholson. The Blues doubled their lead on 49 minutes, Craig Mahon won the ball in midfield and played Asante through on goal, he superbly turned the last defender before scoring past the onrushing Keeper. Asante saw a header cleared off the line before Darlo pulled a goal back as Jordan Nicholson hit a stunning 25-yarder that gave Grant Shenton no chance. Darlington sensed the chance of an equaliser and dominated possession for the next period however this was to be Asante’s day and the young striker completed his hat-trick on 69 minutes curling a shot past Maddison following fine approach play from Anthony Dudley to wrap up the three points for Chester.